This season, theater at Swarthmore will range from psychological drama to love stories, from musical theater to original student plays, from a night of cabaret to classic Shakespeare. The following is a roundup of the productions that make up what Elizabeth Stevens, acting chair of the theater department, calls a “sprawling season.” Read on for a glimpse of this semester’s performances. Purim, a Jewish holiday that celebrates an exciting story with costumes, food, and drink, culminates in the tradition of a theatrical retelling of the story: the Purim Spiel. Swarthmore’s Spiel will take place on the day of Purim itself, Saturday ,February 23, with an invited dress rehearsal on Friday February 22. This telling of the Purim story, the story of a Jewish girl named Esther who becomes queen and outwits the villain Haman, will have its own flavor and style. Ross and Assistant Director Sara Morell ’15 have also stuck to more traditional aspects of the play. These include an attention to Scottish culture (not extending to Scottish accents) and the attempt to adhere to the infamous curse of this play (not saying the name in the theater). For the performance, which will take place in Bond Hall, the “cast will break into small groups and choose what they want to do—it’s in the actor’s hands,” Debuque said. The acts do not have any specific theme and will be a little bit of everything. Both directors will be performing—and so will music professor Andrew Hauze. Three Sisters tells the story of characters trapped in provincial Russia who want to leave, but cannot due to their life circumstances. Johnson called it an “existential dilemma that translates to all times.” Michele Johnson ’16 and Michaela Shuchman ’16, two actors in the play, both mentioned the challenge that this difficult show poses, but also spoke of their excitement and how worthwhile the challenge is. Shuchman emphasized the importance of Chekhov as a playwright: “His plays were the first of their kind where the audience saw their own reality on stage and could truly empathize and relate with his characters.” According to Johnson, the play’s message is universal. “I think that the play would interest anyone drawn to a thoughtful theatre experience that challenges them,” he said. Smaller than many main-stage musicals of the past, this year’s production of I Love You Because will be performed by a cast of six. Director Abigail Henderson ’14 “fell in love with the soundtrack” of this modern love story, and had “wanted to do a fun musical with a small cast.” The show is set in modern day New York and was written by lyricist Ryan Cunningham with music by Joshua Salzman. Jeannette Leopold ’13’s senior directing thesis, written by Lanford Wilson, is both a psychological drama and a love story. Burn This has four cast members and begins with the main character learning of a friend’s death. In the ensuing drama, the characters must deal with loss and learn to love again. With such sad material, Leopold said that she “want[s] to find all the lightness that I can and bring that out.” In terms of directing, she is finding that actors “have so many good ideas. I like to have them do what they know how to do.” Her professional guest (each theater honors major is entitled to a budget and one guest artist) is a lighting designer. The show opens in the middle of a meteor shower and three chairs in a front yard of a country home. Two chairs will be occupied by a brother and a sister, and a third will be empty. Off to the side will be a younger brother in a wheelchair. “This is our wonderful tableau,” Oet said. The third chair will be filled when an ex-president walks on stage, and the play will then begin. “Ultimately the play is exploring the way we make it more difficult for ourselves to have human interactions,” Oet said. Meryl Sands ’13 is currently in a content-gathering stage of her senior directing thesis: an as-of-yet untitled devised piece that she is writing herself. In a devised piece, “you start with the seed of an idea—or a theme, or a source text or a bunch of source tests—and then you build a play,” Sands explained. The play has a cast of five and will potentially feature circus arts. Sands is looking into hiring a guest artist who will consult on puppetry and playing with shadows. The four students directing are Swift Shuker-Haines ’14, Joshua McLucas ’15, Martin Roncada ’14, and Katie Goldman ’14. Pieces can be original, devised, or scenes from existing plays. Photos by Christina Matemoros/The Daily Gazette. This article has been updated to reflect the following corrections: Joshua McLucas’s class year is 2015, not 2014. 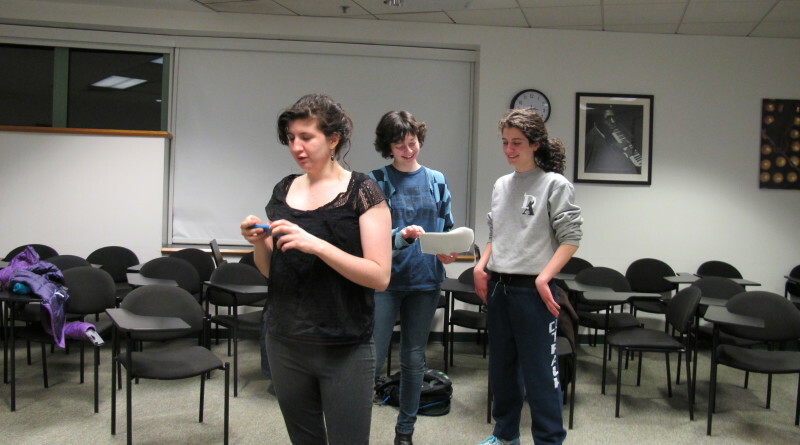 Katie Goldman ’14 is directing a piece in Night of Scences, not Kane Golaman ’14. I’m really glad you made this article – sometimes I forget how much we are all involved in and working so hard on! So much great theater at Swat! 🙂 With so many wonderful people to boot! Where will the Purim Spiel and rehearsal be held? The invited dress rehearsal and performance of Purim Spiel will be held this Friday and Saturday (respectively), both at 9:00 p.m. in Paces Cafe. 2) There will be a 24 Hour Theater Festival THIS Friday 6:30PM – Saturday 6:30PM in Olde Club. It’s not been publicized that much yet, but if you have some free time, come down and perform or watch! I do not exist. I’m fairly certain of that. 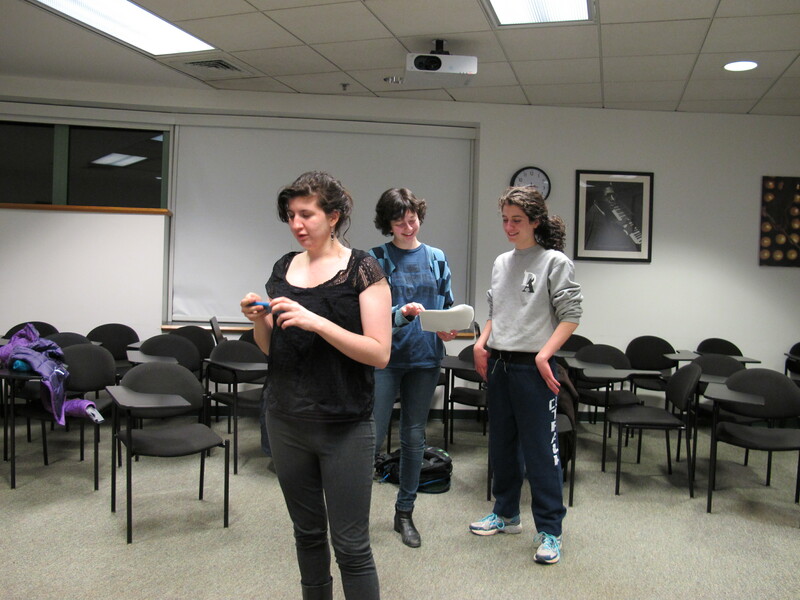 But I do know that Katie Goldman ’14 is presenting a scene for Directing 2.